Patented turn-key solution for simulating simultaneous multi-mode loading conditions required for superficial femoral and coronary artery stents. Peripheral arteries have greater bending, twisting, and stretching motions than coronary arteries, so stents placed in peripheral arteries will undergo greater stresses and strains. 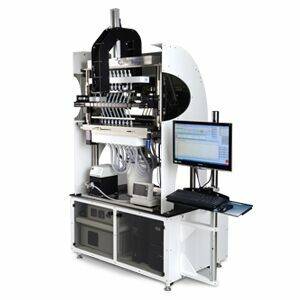 We have developed the ElectroForce 9400 multi-axis peripheral stent (MAPS) test instrument for stent applications in peripheral arteries. This programmable instrument simulates the complex loading that stents experience in the peripheral arteries. These include the renal arteries, the carotid arteries, and the femoral-popliteal arteries.